Back from my well-deserved vacation, I am quite ready to resume my reviewing duties as regards both new and older material. Though I have a couple of reviews of recent releases in the works, I would like to devote the first slot of the new year to what is possibly the most intriguing album by the band that brought us the original Fire of Unknown Origin (pun unintended). Just before Imaginos was released, the mighty Blue Oyster Cult had been in disarray, a shadow of their former powerful selves. With the departure of some key members, the spark seemed gone forever – as witnessed by their previous, rather lacklustre release, 1986’s Club Ninja, held by many as their weakest recording effort. However, the completion of this 20-year-long project (originally conceived by drummer Albert Bouchard and mastermind Sandy Pearlman) brought the original members of the band together for what was destined to be their last great album (in some ways, even their masterpiece), and certainly one of their most progressive offerings. The very elaborate concept behind Imaginos was at least partly inspired by HP Lovecraft’s Cthulhu Mythos, and crafted in order to provide an ‘alternative’ explanation for the onset of World War One. The titular character is a ‘modified child’ with supernatural abilities, whose story is told (though not in chronological order) in the nine songs on the album, and foreshadowed on two songs featured on 1974’s Secret Treaties – “Subhuman” and “Astronomy”. Both appear on Imaginos, the latter with a different musical arrangement (in my view inferior to the original, and way too ‘Eighties’ for my tastes), the former rewritten as “Blue Oyster Cult”. Such an intriguing, grandiose concept needed to be implemented accordingly. Therefore, the five members of the band brought on board a number of other musicians, including the ‘Guitar Orchestra of the State of Imaginos’, an impressive array of lead guitarists that included The Doors’ Robbie Krieger (who had already guested on BOC’s “ET Live”), and six-string wizard Joe Satriani. The result is a rich, majestic sound that fits the storyline like a glove, immediately noticeable from the first strains of opener “I Am the One You Warned Me Of,” which sets things off with a bang. In comparison to the somewhat limp-wristed nature of the band’s previous two efforts, The Revolution by Night and Club Ninja, an exhilarating sense of energy can be clearly perceived here. Even the more accessible numbers, like the sax-driven title-track, which closes the album on a somewhat cheerful note, in spite of its rather disturbing lyrics, or the even more upbeat “Del Rio’s Song” (possibly the album’s weakest link) seem to barge in with an assertiveness approached by none of the compositions appearing on either of the above-mentioned releases. Vocalist Eric Bloom – one of the most distinctive (and underrated) voices in rock – is at the top of his game, belting out the obscure lyrics with self-assured forcefulness. On the rousing “The Siege and Investiture of Baron von Frankenstein’s Castle at Weisseria”, though, Bloom is replaced by guest singer Joey Cerisano; the song climaxes with a haunting chorus of “World without end”, and Joe Satriani’s blistering solo makes it even more memorable. Buck Dharma’s well-mannered voice does the honours on “Les Invisibles” – though the song itself is anything but reassuring, with its sinister synth effects and guitar work, and its insistent, almost obsessive repetition of the word ‘seven’; while “In the Presence of Another World” is a dark-hued mid-tempo, almost ballady at times, with a thundering, yet oddly catchy chorus stating that “Your master is a monster”. The true highpoint of the album, however, comes in the second half, with the double whammy of “Magna of Illusion” and “Blue Oyster Cult”. The former, named after the mysterious obsidian mirror that Desdinova (the new name given to Imaginos by his rescuers, the human servants of ‘the Invisible Ones’) finds in a jungle in the Yucatan, and which, kept for twenty years in his attic, poisons the minds of European leaders before the outbreak of WWI, is a triumphal, keyboard- and guitar-laden march related from the point of view of the protagonist’s granddaughter. “Blue Oyster Cult”, on the other hand, is as creepily addictive as its earlier version, “Subhuman”, with an anthemic close celebrating the occult nature of the band’s name as originally conceived by Sandy Pearlman. 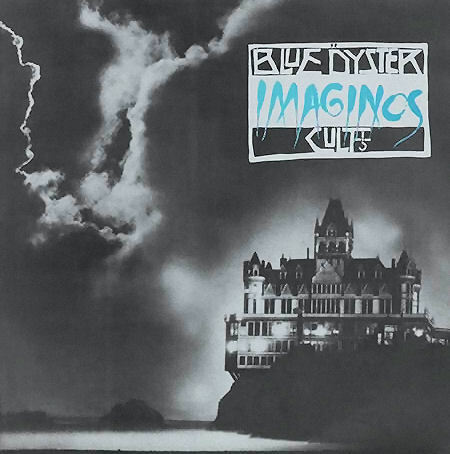 Many BOC albums boast outstanding cover artwork, and Imaginos is no exception – the über-Gothic Victorian mansion (a San Francisco landmark burned to the ground in 1907) poised on a cliff on the background of a stormy sky aptly conveying the sense of mystery and menace implicit in the whole story. At any rate, despite its Eighties-style production (rather evident, for instance, in the drum sound), this is an album of epic proportions that will appeal to both hard rock and progressive rock fans – a much-needed reminder of the greatness and unique approach of this seminal band. “Vocalist Eric Bloom – one of the most distinctive (and underrated) voices in rock – is at the top of his game, belting out the obscure lyrics with self-assured forcefulness. On the rousing “The Siege and Investiture of Baron von Frankenstein’s Castle at Weisseria”, Bloom is flanked by guest singer Joey Cerisano; the song climaxes with a haunting chorus of “World without end”. When I did the lead vocal on Frankestein’s Castle Eric Bloom didn’t flank me he, in fact he wasn’t even in the studio. He probably wasn’t even on Long Island where we recorded the song. Thanks for pointing that out! I’ll edit the review accordingly. I wish there was some way for Me to read “The soft doctrines of Immaginos” It is My favorite “conspiracy theory”.